Driving east on forlorn little State Route 23 in southeastern Washington, I can’t believe my eyes. Rolling green and beige hills swoop and peak across the landscape, punctuated by the occasional hay barn or tractor-riding farmer topping a mound. I’ve seen lots of farmland in my day, but none has looked like this. Up ahead, an especially big rise comes into view, and I realize that must be my destination, the 3,612-foot Steptoe Butte. Within a few more miles, I am in Steptoe Butte State Park Heritage Site, at the base of this quartzite hilltop, and follow the road around in a circle as my van climbs 1,000 feet in elevation above the surrounding agricultural fields. As I drive onward and upward, the views only get more dramatic as the afternoon sun starts turning the wheat fields below from beige to gold. A paraglider with a blue-and-green sail drifts in and out of sight, breaking up an otherwise serene scene. A little-known secret of landscape photographers for decades, the Palouse draws thousands of visitors every year looking for nothing more than peace, quiet, two-lane country roads and spectacular vistas. The breach of an ice dam that took place thousands of years ago near today’s Sandpoint, Idaho sent water and glacier-ground silt (known as loess) across the region, laying the groundwork for some of the most productive farmland west of the Great Plains. 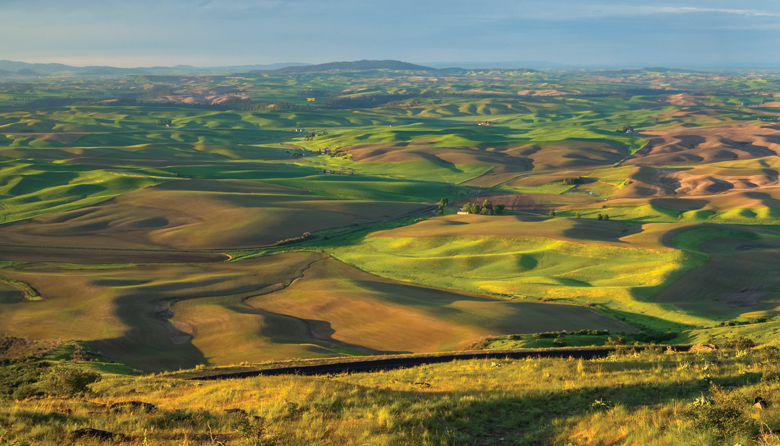 Cut to the present, and the rolling hills of the Palouse are draped in green, beige, yellow, mauve and other all-stars of the agricultural rainbow. After taking in the otherworldly Steptoe view, I get back in the van and head south to what I consider deluxe digs, a campsite in Kamiak Butte County Park, on the flanks of Kamiak Butte, another quartzite rise with similarly striking views, about 25 miles to the south. Snagging one of the eight first-come, first-served campsites, I set up my tent and eat a PB&J for dinner at my picnic table, steeling myself for the 3.5-mile Pine Ridge loop hike to Kamiak’s 3,641-foot summit. With camera, tripod and headlamp in tow, I start walking, ready to capture the golden orb’s farewell. After about an hour of hiking and more than 600 feet in elevation gain, I summit the butte and watch in awe as the sun bathes the landscape in pink and purple hues. Bustling Seattle, less than 300 miles to the west, may as well be halfway around the world. The next morning, I wake up with the sun, pack up the tent and head into nearby Colfax. It’s hard to believe that this sleepy little town was one of Washington’s population centers in the late 1800s. I grab a latte and a slice of still-warm coffee cake at Fonks Coffeehouse on Main Street and then make my way over a couple of blocks to check out Perkins House, an elaborate Victorian-era mansion, built in 1887, that now serves as the home of the Whitman County Historical Society. Out back, a dilapidated log cabin stands in stark contrast to the mansion in front of it, underscoring just how far this little town came in less than two decades during the height of the pioneer era. With the two buttes and lovely little Colfax checked off my bucket list, I head west on SR 26, another lonely country road cutting through even more scenic rolling farmland, stopping to photograph the occasional weathered barn against a colorful corduroy of crops. Another hour behind the wheel melts away, and I turn south onto SR 261, destination: Palouse Falls. Cutting through basalt outcroppings—the rolling loess farmland now long in my rearview mirror—I turn into Palouse Falls State Park and drive up to a fenced ledge overlooking stunning Palouse Falls. Designated as the state’s official waterfall by legislative decree in 2014, this cascade doesn’t disappoint, horse-tailing itself 186 feet into a huge basalt punch bowl. Visit the Victorian-era Perkins House in Colfax, a sleepy town, once a booming population center. Photograph by Colfax Chamber of Commerce. As I stand there gazing into the gorge, a yellow-bellied marmot emerges from the rocks underfoot, whistling to make its presence known. It’s hard to believe that tomorrow—after another night in my tent at the small, first-come, first-served campground behind the falls overlook—I’ll be back in bustling Seattle. But the restorative powers of this weekend away should last a while, and I’ll try to keep it in mind as the sights, sounds and smells of the big city welcome me back into its fold. The Palouse region of Washington is about a four-hour drive east from Seattle. Haunted Palouse (visitpalouse.com), a town fundraiser featuring entry to two haunted buildings and a hay ride on October 19–20 and 26–27 in Palouse.